We believe in romance and celebrating individuality in our dresses. We believe that for every bride, her wedding day it the one day when the world stands still to take in all her beauty. So with our hand crafted precision and expertise we create dresses that are a vision with timeless beauty; that fits beautifully and is effortlessly styled to give the bride the grand entrance she dreamed of, as she takes her first steps down the aisle. 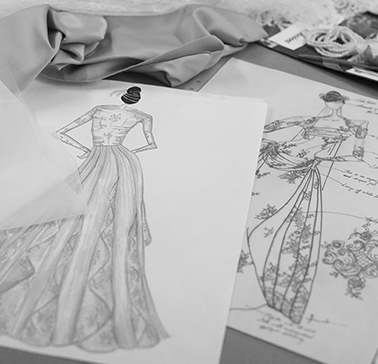 We are passionate about the dresses we create as we place stitch for stitch and bead for bead! Every cut, shape and embellishment is added with love, so our wedding dresses can be the symbolism of your love and happiness, to be “the dress” you will always treasure.